Katherine of Aragon, the True Queen by Alison Weir-Katherine of Aragon, the first wife – and many would say the only *true* wife – of Henry VIII. A devout woman who watched her King become a monster. In this book, the first in a series called The Six Tudor Queens, Allison Weir gives Katherine the voice that she often didn’t have during life, and that has been brushed aside by the notoriety of her husband after death. Always being interested in this portion of history, I was excited to read about her. In most ways, the book fulfilled my hopes and expectations, though there were a few things that bothered me. For most, Katherine of Aragon is mostly a footnote in history, a queen who was put aside as her king became more and more debauched. In this book, Weir shows the human side of Katherine. The woman who truly came to love her king, though she had been married to (and widowed by) his older brother, who had been extremely ill when they married. The marriage was never consummated, and Katherine, ever a pawn between countries, was left in a state of limbo. For several years, her status at court diminished, until she was forced to pawn her own jewelry to keep food on her table and clothes on her back. Eventually, she was married to Henry, and from there the book really takes off. The reader gets an inside look into Katherine’s life, from her marriage to two kings, to her death far away from court, broke and mostly alone. I found myself riding a bit of a roller coaster while reading this book. First of all, it is historical fiction, so by and large it is one person’s attempt at recreating history. My biggest peeve with this particular attempt was that Weir often made Katherine out to be an absolutely blind fool. Over and over again, it seems that Katherine was used, and never did she see it. This goes equally for Henry – I struggle to believe that this queen would have insisted for so long that Henry would recognize the error of his ways and all would be right again with the world. Katherine was in every sense a strong Spanish woman, who (I believe) would have recognized at some point that Henry was well on his way to destroying himself and his country. Court back then was a vicious game, and for her to have survived as long as she did suggests to me that she was no simpering princess. However, having said that – the book is fascinating. As Weir explains in the back, it is absolutely necessary to try and understand Katherine from the time in which she lived, and this book definitely brings that period to life. Women then, whether queens or not, were mostly just pawns in a vast political game where no one knew all the score at any given time. Overnight, they could be reduced to poverty when they had been raised in riches. Intrigue sprang up in every corner, people vying to be favored in court. It was a dangerous time, when disagreeing with the king could quite literally get you killed. Weir brings all of this to life, and I found myself in tears as the book ended. I look forward to the next book in the series, for a couple of reasons. One, I’m curious to see if/how Weir overlaps Queens (as Henry certainly did). It could potentially be tedious to read so much of the same information over again, even from another perspective. However, Weir’s writing is such that she has a way of truly wrapping the reader into the story and bringing the characters alive, which makes reading about history that much more interesting. Overall, I highly recommend this and will be waiting for book number two! 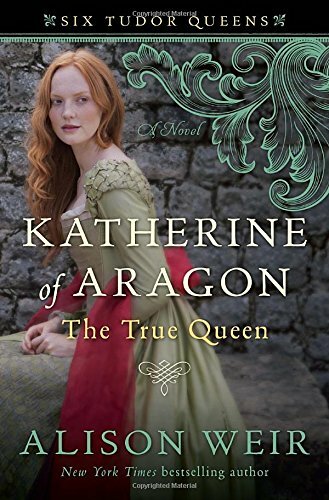 Alison Weir, Katherine of Aragon, review.